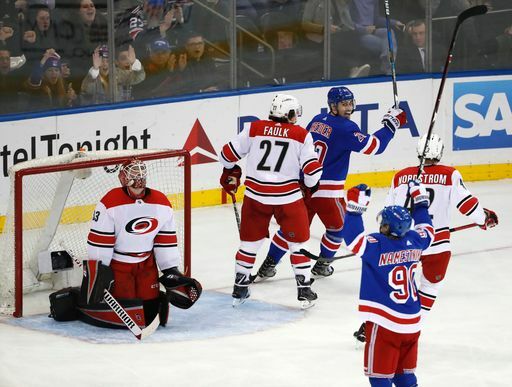 The Rangers continue their busy start to 2019, returning home to take on the recently hot Carolina Hurricanes. The Canes are 7-3-0 in their last ten games, and making a significant push towards the playoffs. They may not get there, but they are certainly going to make it interesting for the Isles, Sabres, and Habs. As for the Blueshirts, they have one win this year. But hey, it came against the Islanders, so that’s a bonus. Ryan Lindgren makes his NHL debut tonight, fresh off his recent recall. That means Neal Pionk will be out still, and likely Brendan Smith will be the healthy scratch if Adam McQuaid can’t go. I just hope that Ryan Lindgren puts on a good show tonight. What I saw of him in Hershey, and what I also read, he is going to be a hard nosed player. Good luck kid!!!!!!!!! I am rooting for Lindgren myself. Of all the prospects he is one of a couple I have high hopes for. If he plays anywhere near what he displayed in the WJC….oh man…He was an eye opening player in the WJC and his play made made me envious of the Bruins at the time. I was very happy we got him. People are down on Wahlstrom, don’t be…he will make an impact. What I saw from Kravtsov in the WJC, I am on board with the selection more so now than before. Agree with your post, especially with your comment about Kravtsov. The kid played out of position during the U20 tournament, while being hurt himself, yet doing a stand-up job in the process. I think JG did right by us with his selection!!!!!!!!!!!! Look at that Leather … u win a draw in the O-zone and good things happen! Lindgren is doing ok out there, as is Delangelo. Makes one wonder why Quinn has been overplaying Pionk. Quiet steady game for the kid. I bet he was a bundle of nerves before his first NHL game started…………..
Buch must have read some of the post today about his lackadaisical play because he scored two on the PP tonight!!!!! Until I see improvements in 5v5 scoring rates, 2pp goals is fools gold. What’s foolish is playing Buch on the 4th line. Do you expect high 5×5 scoring rates under those circumstances? I can live with this win as it’ll get the trade value up on Zucc.